Vit.B12 symptoms might get worse at first after treatment with Vit.B12 injections. The oneliner “no pain no gain” can also apply in treatment of a Vit.B12 deficiency. After starting with B12 injections, people with a deficiency start to question the result of the therapy. They mainly have concerns about their disease symptoms getting worse at first. Two articles pay attention to this “phenonemon” the first link of Rose Ann Furhmann about repair damage of a Vit.B12 deficiency. And the second link from the Medical Library by M.D. Roy Kennedy. I have add some personal thoughts of me on this article. When damage has occurred over a long period of time, repair can continue for years. When deficiency is treated early enough, damage may be repaired quickly and completely. The longer treatment is delayed, the more likely repairs will take many months to years and be incomplete. Do not despair if a symptom becomes worse at some point after treatment begins. This sometimes happens when the body is addressing that particular problem, and often the symptom becomes dramatically worse temporarily (briefly to much longer). Symptoms can even multiply previous to great improvement. No guarantees, but this often happens when damage has been serious. Many people who have serious damage experience what I call a honeymoon period within days or weeks of starting treatment. At that point it may seem that improvement is so rapid they begin planning to dance on tables within a few months. Then, in those who experience great fatigue and increased symptoms as their bodies begin very hard work on serious repairs, fear is common and reasonable. Recovering from damage is often not linear. It isn't like getting over the flu or a cold, or healing from a wound. Nerve repair is slow and can be very weird. Many of us have settled on "weird" as the best way to describe it. And very few medical people have the slightest understanding of that process. Many in fact assume, irrationally, that as soon as the B12 deficiency is corrected, the body will miraculously be back as good as new. As if even a simple knife wound would be healed as soon as the knife is removed. Ridiculous. B12 is necessary in small amounts for the formation of proteins, red blood cells, the function of the central nervous system (production of myelin — the stuff which serves as insulation for the "wires" of the brain, spinal cord and peripheral nerves) and maintenance of the inner lining of the intestinal tract. B12 is not available from vegetable sources and is produced only by microbes (bacteria and algae). Microbes found in the mouth and intestine produce sufficient B12 for most people. The body generally has stored a three to eight year supply of B12. It is true that B12 is present in animal products, but when you look at what else also is present, you will want to choose to learn a little about these not-so-well-known oriental foods which contain B12. An abundance of B12 helps in the production of red blood cells, helps keep the nervous system running smoothly and helps maintain the integrity of the intestinal mucosa. A B12 blood test tells the doctor the level of B12 is in the blood. However, B12 has its action inside cells. Some people are deficient B12 at the intracellular level while the serum tests in the normal range. Some people cannot transfer B12 that is absorbed from serum to the tissues. Methylmalonic acid and homocysteine tests should be done to see if either or both of those has risen. These are metabolites of B12. If, when B12 is given, these high metabolite(s) fall, it is likely that the patient needed the B12 which was administered. * The author of this article states that there is a chance that a vegetarian can become B12 deficient since B12 is not availaible from vegetable sources. To avoid this he recommends to add the oriantal foods like soy and tempe, since they contain B12. I think this is not correct, other scientific investigations showed that the B12 in this food is no real B12 but analogues, which the body can’t use. ** This is the first article I come across that provides a good explanation for the worsening of symptoms, reported by many people, after just starting to inject. If this is indeed a sign of nerve repair, this should be welcomed. Both the worsening of symptoms on start and the lack of an immidiate respons can, by lack of knowledge of both the MD and the patiënt, result in stopping the treatment a.k.a. the injections. Instead of stopping the injections it is at that point very important to continue treatment, something to keep in mind as a patiënt! By the way, if there is no worsening of symptoms in starting treatment, that doesn’t mean that the B12 doesn’t work, but maybe more that there is not yet any significant nerve damage. *** The author probably means the sublingual tablets that are nowadays available. One should be very critical here, there is a big quality difference in them, a lot of them simply aren’t any good. + Worsening of symptoms on start is a marker for nerve repair. + Everyone with neurological complaints should get B12. One should keep in mind that a minority of B12 deficient patiënts will not be discovered because the tissues are deficient although serumlevels are normal. I think that a correct interpretation from what the author means is: Anyone, under suspicion of having a B12 deficiency, should get B12 treatment when there are neurological complaints even if serumlevels don’t show the deficiency. 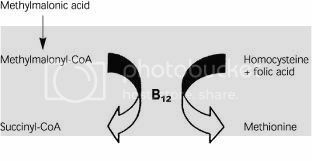 + The importance of methylcobalamin, as this is the cobalamin the body needs for nerve repair. This also explains why it is possible to achieve higher levels (sometimes) with high quality sublingual tablets.